This interactive Earth app lets kids explore and discover, but they won’t learn much without parental support. 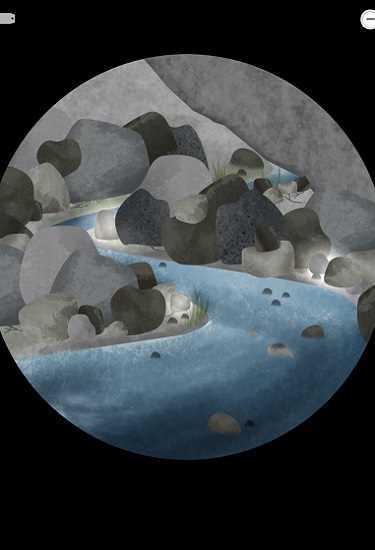 The Earth is a science app that lets kids discover geological forces of nature -- such as volcanoes, earthquakes, glaciers, and rock slides -- by tapping an interactive model of the Earth. 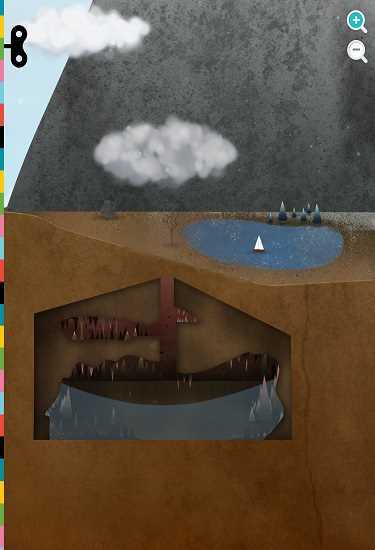 The app encourages self-discovery through open-ended play without any instructions. 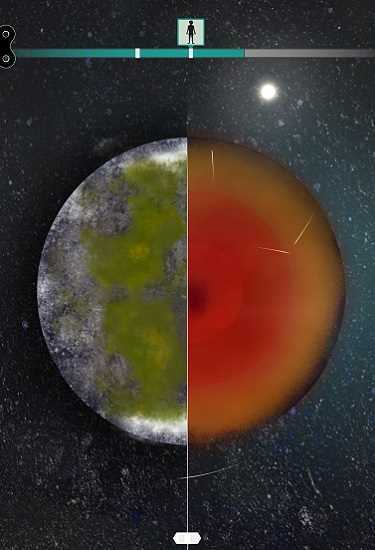 The Earth app presents players with a view of planet Earth in outer space. They can see how Earth’s geological formation has changed over time by dragging a slider back and forth, or zoom in to see a cross-section of present-day Earth. Kids explore the Earth’s various regions, from deserts to snow-covered mountains, by dragging their finger along the screen. 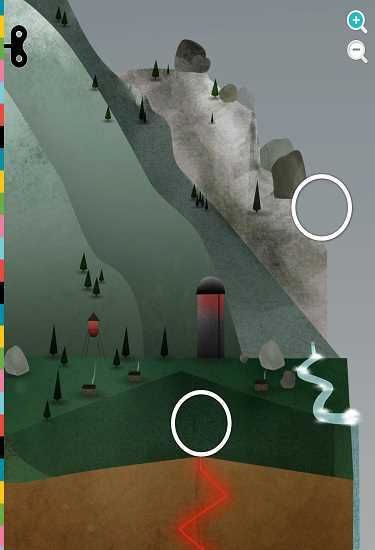 When they come across a point of interest, indicated by a white circle, they can tap it to zoom in on an interactive scene. 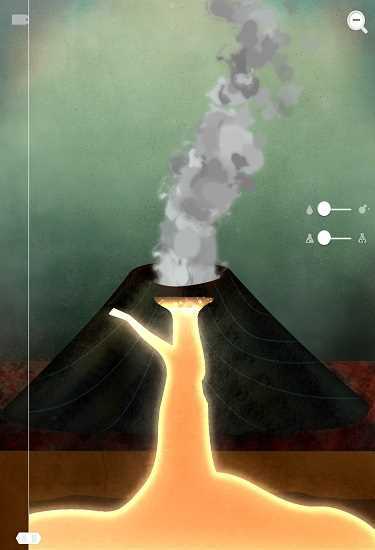 For example, kids can make a volcano erupt by using a finger-swipe to draw magma up through the volcano. They can trigger a rockslide by rapidly tapping on a mountainside. Likewise, swiping the “wind” across a desert shows sand dunes forming. Kid can witness the results of erosion by sending waves crashing into a shoreline. There are about a dozen of these little scenes to explore. Kids who are used to apps that provide regular goals and feedback might have trouble staying engaged with The Earth without a parent’s guidance. 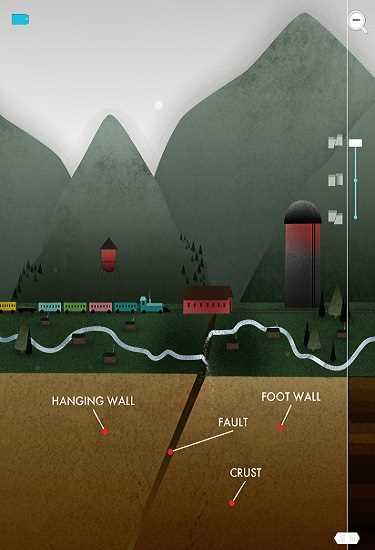 The only bits of text in the game are labels that identify different parts of each interactive diagram (such as “faultline,” “crust,” and “boulder”) – not even the menus have instructions. Overall, the kind of learning experience kids have with The Earth is too dependent on how much of the information in the supplementary handbook that the parent is able to read, absorb, and pass along. While we love the idea of kids and parents enjoying the app together, the app could shoulder more of the responsibility for engaging and teaching. There is a “More Apps” link accessible from the home page. When tapped, the link displays other apps from the developer with “Buy” links that take kids to the app store. The “Buy” links are hidden behind a very simplistic pay gate (swipe finger across the screen), making it easy for kids to get around the gate and into the app store. The Earth is best for curious children who have the patience to stick with the app and push through its idiosyncrasies. This is a good educational app for parents and kids to explore together, particularly when parents have read the handbook and educated themselves so that they can provide the much-needed context for kids. This The Earth app review was written by Erin Bell.